I love shopping after the holidays because it's the best time to get all the stuff you wanted before Christmas, but now its marked down to almost nothing. I also love post-holiday shopping because new Spring items are making their way into stores and online. Savoy Accessories is a handbag line I've been eyeing for a while – their debut collection was so impressive it was hard to believe they were newcomers on the handbag scene. I had the opportunity to visit the showroom and preview the entire Spring 2007 collection in person. 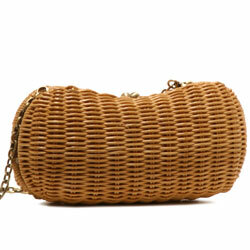 The Spring handbags are full of airy whites, fresh neutrals, and punchy patents. The collection features Savoy's modern shapes and use of contemporary materials. 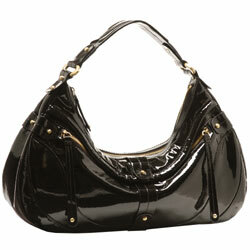 Shiny patent leather totes are slouchy shaped, simply studded hobos, totes, and satchels. 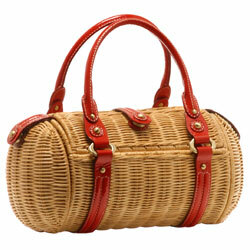 The remainder of the collection consists of wicker – beautifully transformed from lawn furniture to stylish bags. 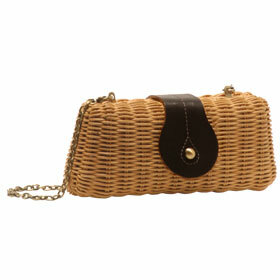 The wicker collection is extensive, and endearing. From kidney bean shaped clutches to patent-trimmed barrels, to totes with patent trimmed pockets, the wicker bags are the perfect complement to your Spring wardrobe. The Fiji Felicity - A bean-shaped bag for daily Sunday strolls on the sand.